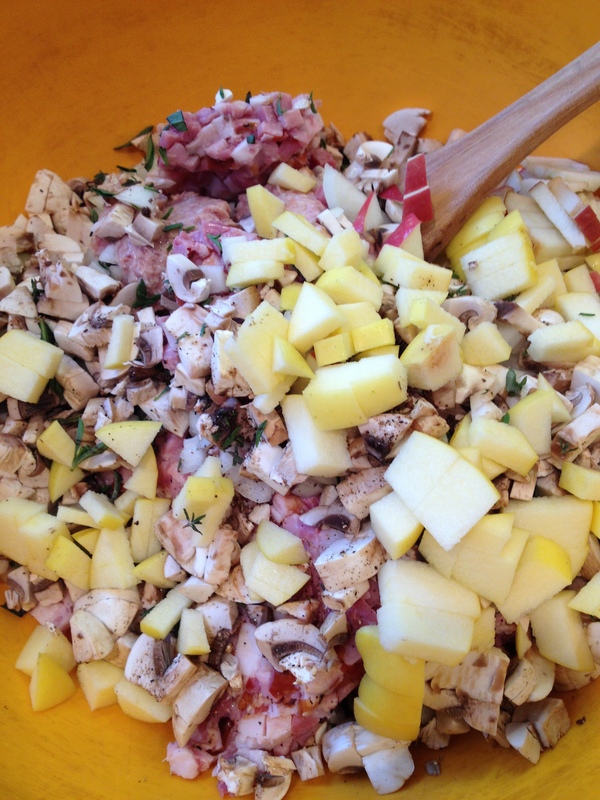 I developed this recipe because I knew I was going to talk about Joel Salatin’s Farming Workshops on CBC Radio and I thought this would be the perfect way to use Pastured Poultry – one of Salatin’s topics for his workshops. Sunshine Organic Farm and Sunworks Farm are two Alberta farms already raising chickens in this humane and healthy way. The recipe makes enough for 2 large turnovers. If you are having a lot of guests in for Easter brunch cook both. If not, make them both at the same time, cook one and freeze the other. When you want to cook the frozen one later, just thaw it in the fridge overnight and pop it in the oven the day you want to entertain. That’s cooking it forward. 1. 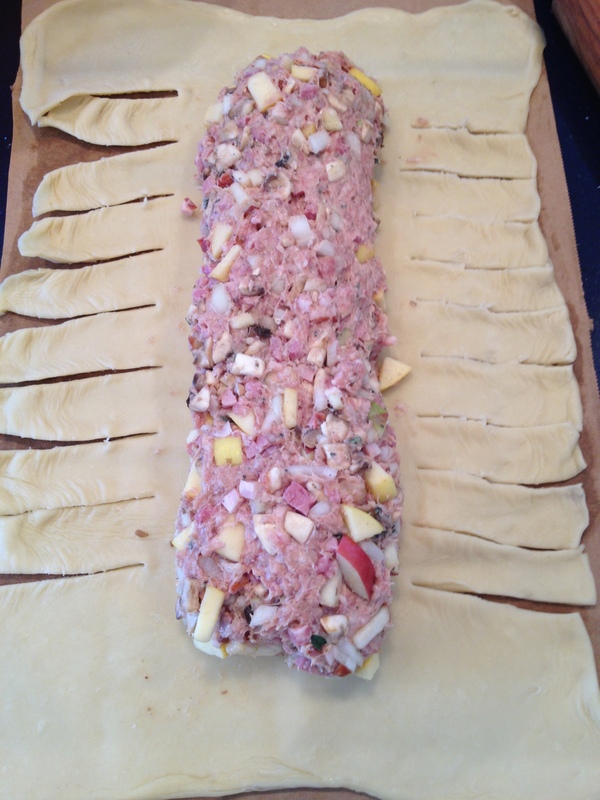 Mix all the ingredients (except puff pastry and egg) in a bowl. 2. Divide the mix in half and form each half into a log about 4 – 5 inches wide and 2 inches high. 3. 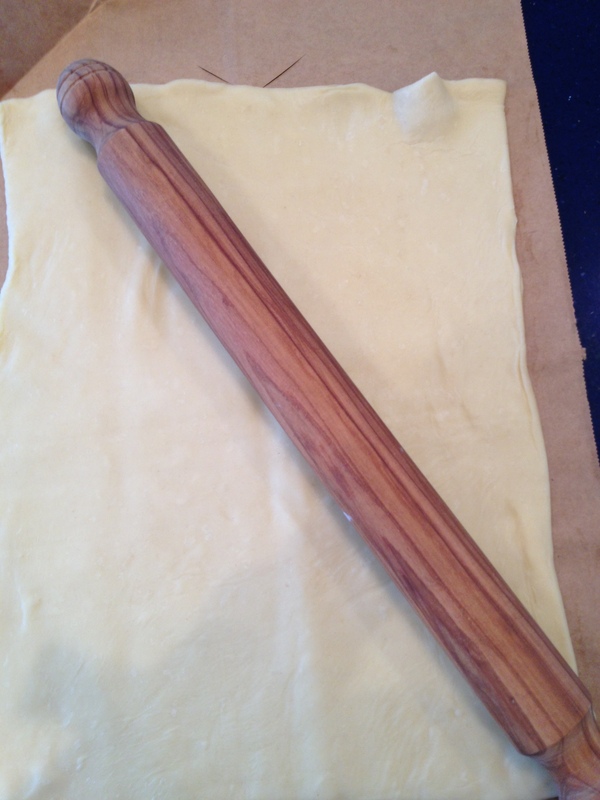 Spread 2 sheets of parchment paper (the size of a cookie sheet) out on your counter and lay a sheet of puff pastry on each parchment. 4. 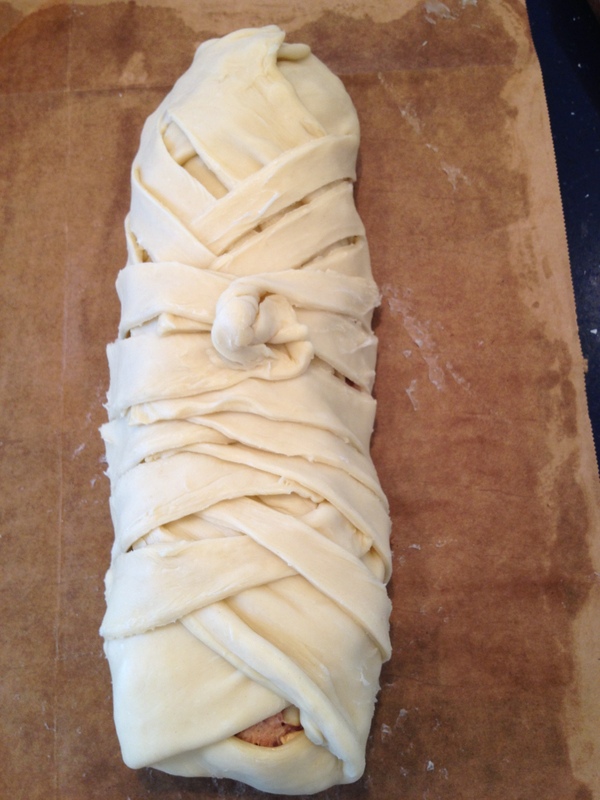 Roll the pastry out to within a few inches of the parchment. 7. 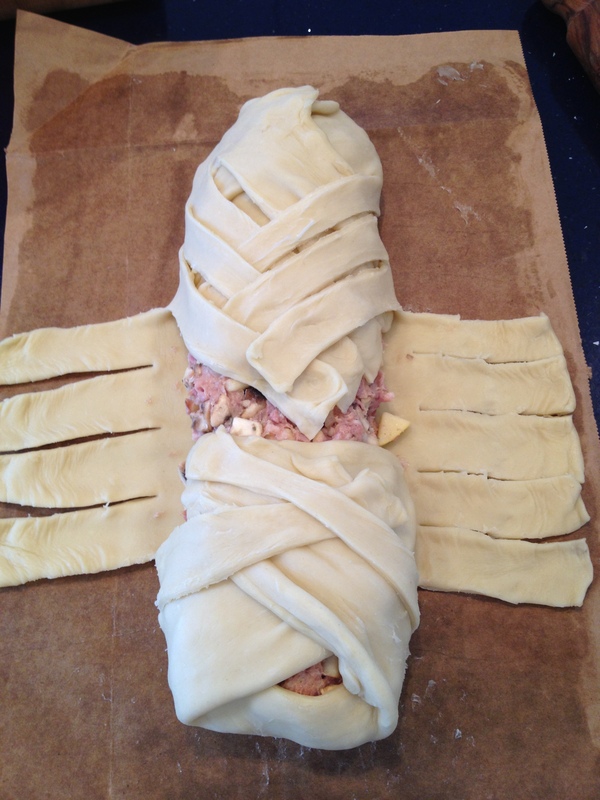 Wrap the end pieces up over the meat mix and then criss-cross the strips to create an overlapping lattice effect. 9. 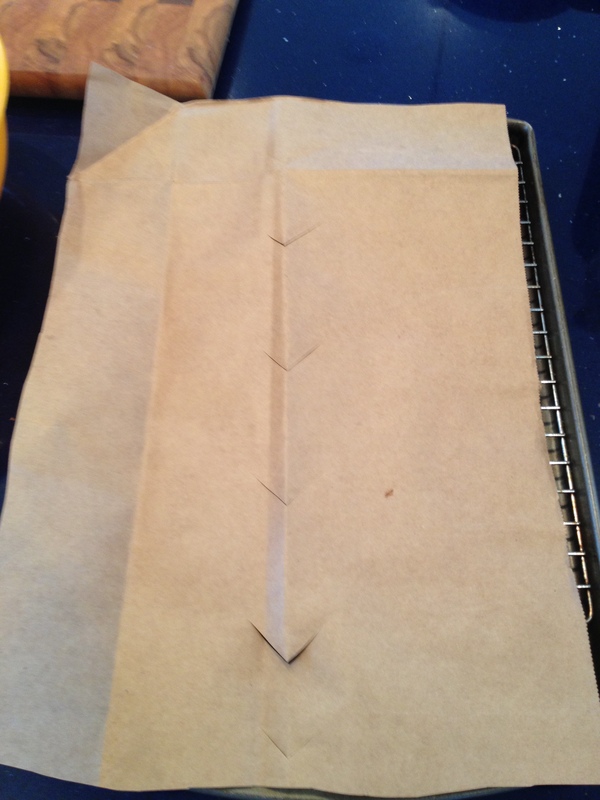 Cook the turnover on the parchment (with a few holes poked in it) on a rack on a cookie sheet in a 375°F oven for about 90 minutes. 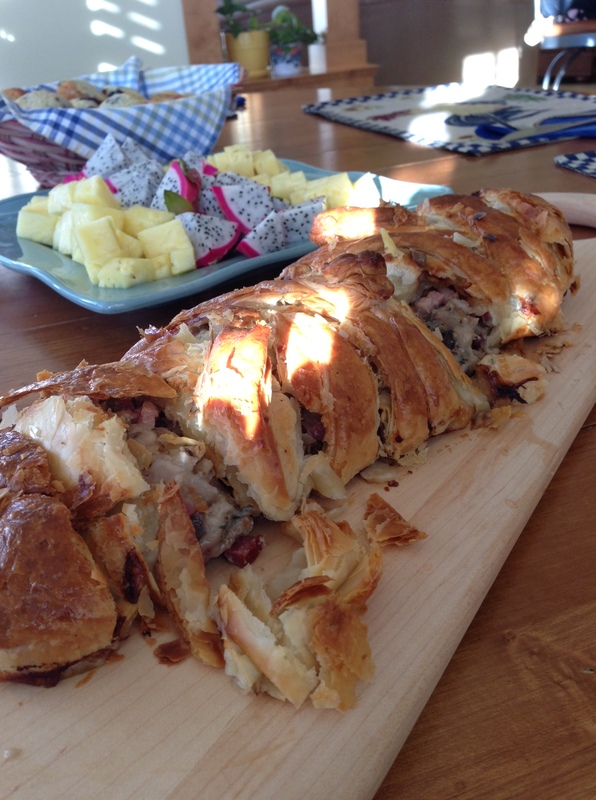 I served this with sides of bacon, scrambled eggs, fresh fruit and some mini-blueberry muffins hot from the oven. More importantly, I served it to friends, Cindy Lazarenko and Geoff Lilge of On Our Table and their daughters as well as my talented CBC colleague Tina Faiz (credit to Tina for the last picture above). I usually get up in the dark each winter Sunday morning to go skiing with my family. Because I had company, I stayed home, drank some coffee and slowly put together a nice little brunch for us to savour together in my sunlit kitchen. I love skiing but it was nice to have an easy paced relaxed visit with my friends. That will always be the best part of cooking for me. I love sitting down with friends to savour our food and savour our life together. I wish you and your family a Happy Easter. Maybe you’ll even try this tasty turnover. I’ve been dreaming about this delectable turnover ever since you treated us to it in your lovely kitchen, Karen! Can’t wait to re-create it at home, though it will never quite be the same without your company!